Welcome back ladies - hope you are all fresh-faced and bright-eyed! Today we are going to work on finishing up the First Look of the elastic waist-ed Cricket dress.We don't have as much work today, so feel free to finish your first and start another! Louisa has already requested many more of these for her wardrobe! Yesterday we left off after construction of the bodice. Your homework was to attach the sleeves. Now we are back with sleeves on and ready to go! You should have the sleeves completed (cuffs attached) and side seams sewn. So, let's start from there! First, grab the elastic. 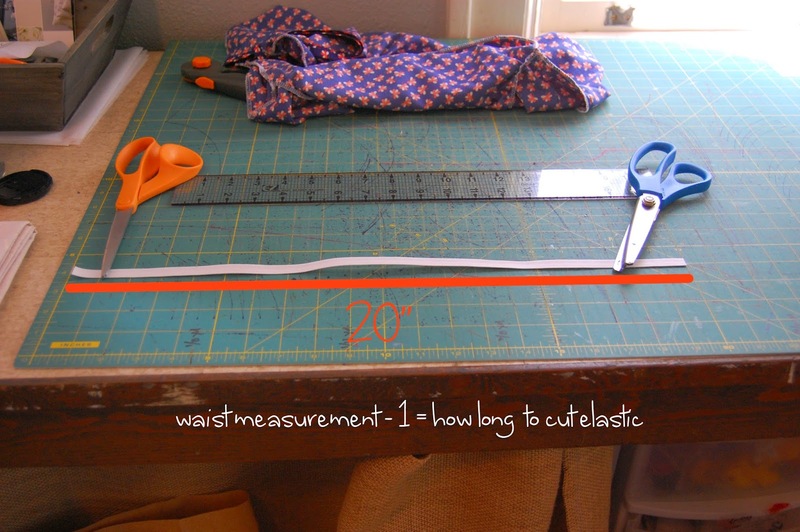 You want to cut the elastic 1" less than your child's waist measurement. In my case, Lou's waist is 21". So, I cut my piece of elastic at 20". 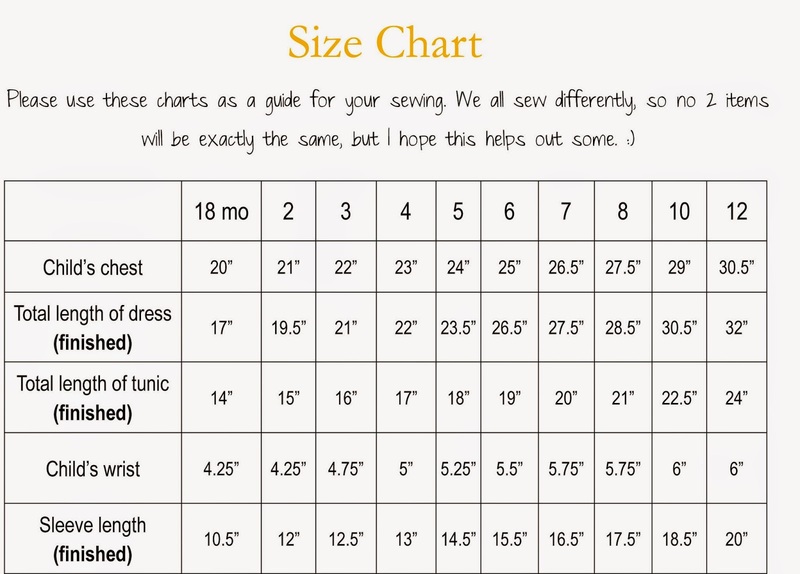 As with my patterns, when I am using measurements please don't confuse mine with yours. I just find it is easier to instruct with actual numbers. Then, you want to divide the elastic into 4ths and make marks. All those allergic to math, don't stress out. This is the hardest it gets. So, for me I am going to make a mark at 5", 10" and 15". so I will make a mark on my waist line at 7.5". Flip the dress over and do this for the other side of the dress as well. All of these marks are about to make sense. I promise. What you will do is start your elastic along a side seam. Then, you will stretch the elastic along the waist line you made so that the first mark on your elastic lines up with the center of your dress (front or back). Then, still stretching, the halfway mark on your elastic should line up with the other side seam and then the last mark on your elastic should hit the halfway mark on your waistline on the other side of your dress. I don't know if it is because I am up late with the Crickets (heeeeee, I couldn't help myself) or what, but that sounds way more confusing than it is. Trust me. Okay, now it is go time! 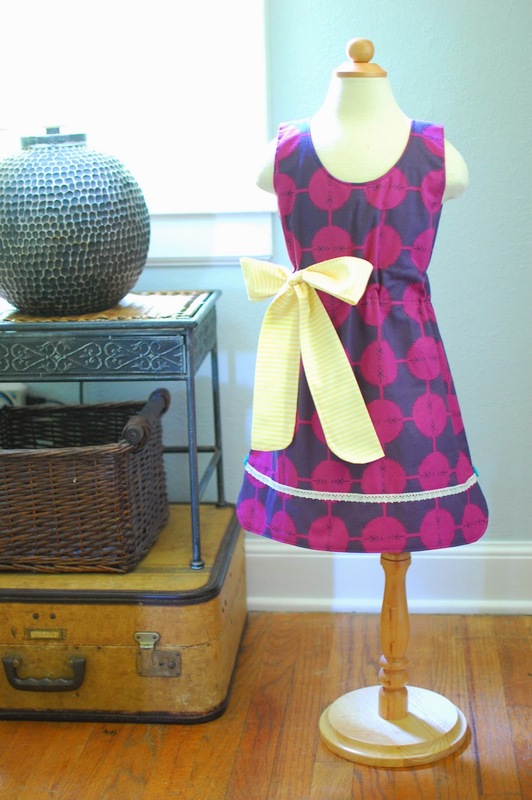 Take your elastic and your dress over to the sewing machine. You will be sewing on the WRONG side of the dress, and make sure that you are not sewing the front to the back of your dress. That would not be fun. Start your elastic on one of the side seams. Stitch it in place with just a few stitches so that it stays in place. 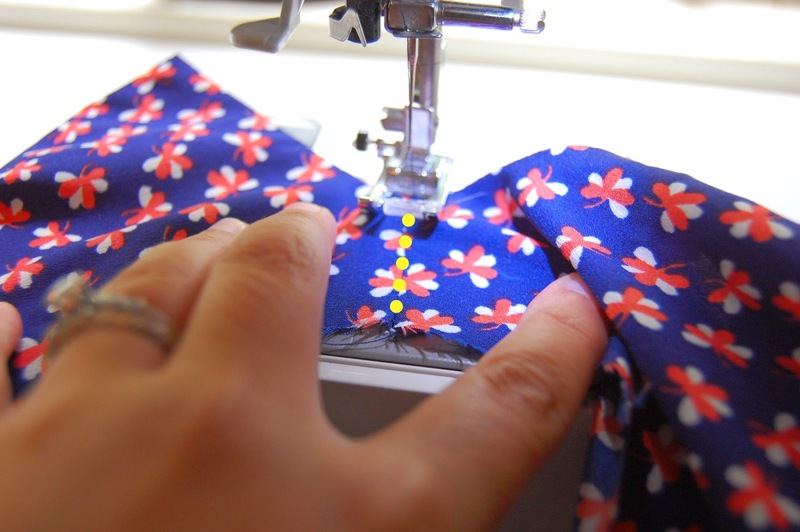 I recommend using a zig-zag stitch to sew the elastic so that the stitch has some stretch with the elastic. THIS IS WHEN YOU NEED TO HOLD YOUR MOUTH JUST RIGHT. Trust me. Once the beginning of your elastic is secured to the dress at a side seam, you want to pull the elastic so that the first mark on your elastic matches with the halfway of your dress front or back. In my case, my 5" mark on the elastic will be stretched to meet the 7.5" mark on the waistband of my dress. 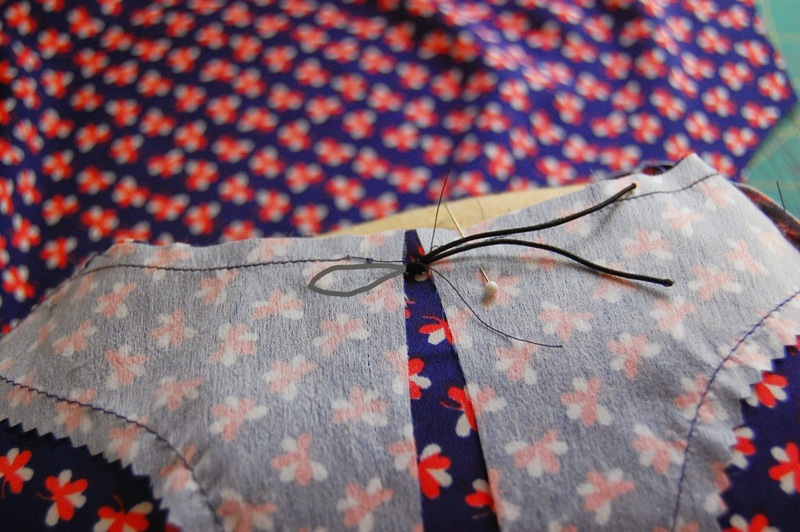 Then, you want to stitch the elastic as you stretch it to the dress using a zig-zag stitch. As I said, hold your mouth just right and take your time. You are so close to being done but trust me when I tell you that you don't want to have to use the seam ripper on zig-zag and elastic. What I usually do is hold the elastic behind my presser foot to give it some tension with my left hand. Then I hold my elastic stretched to the correct point with my right hand and sort of sandwich the dress between my fingers so that I know I only have one layer being sewn. Clearly my left hand is taking the photo here, but this gives you an idea of how I roll. 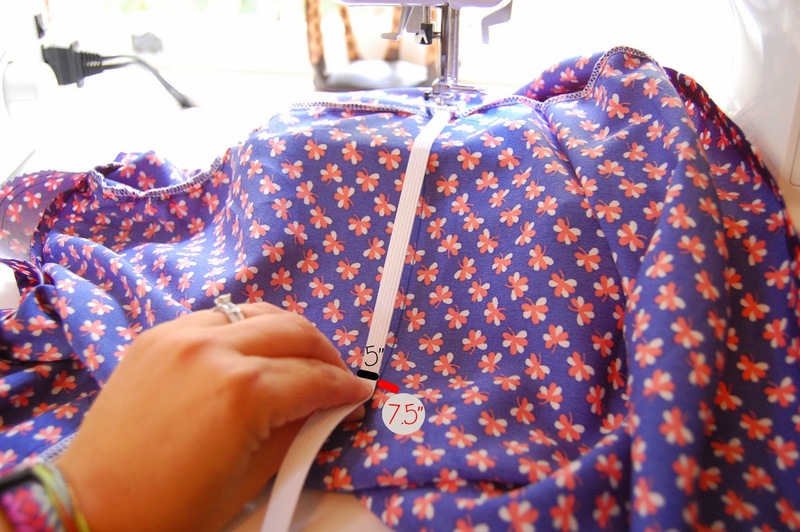 Once you get to the first mark on your elastic, place your needle in the down position and then reconfigure the fabric so that the halfway mark of your elastic will now be stretched to meet the other side seam. Remember to keep the elastic on the line you drew for the waist. Once there, again drop your needle down and regroup to stretch and sew to the next mark and so on. You will do this until your elastic comes back around to where you began. Continue to stitch the elastic down with the zig-zag stitch until it is all in place. Guess what ladies...you have so done it. It is almost time to turn that dress right side out and admire your new creation. But first, let's get that hem done. Sadly for me (with this fabric) the hem was the part that made me say the most bad words. But honestly, if you have a thinner fabric, do yourself a favor and grab the interfacing to line the hem with as shown on page 23 of the pattern. I would not have survived had it not been for interfacing on this dress! Once hemmed, you are at your last and final step! This step also happens to be my fave, the button! You will place your button the same way you would in the pattern, so I won't go in to too much detail here. However, I was thinking about something as I looked at this picture. That button came from one of my many trips to my fave antique store. Since I bought the buttons while I was there and used them for my business - I can write off the rest of my purchases there, right? I mean all the furniture and pieces I come home with, they are accessories to the purchase crime right? Haaaaaa. Gosh, don't I wish! Okay girls - you are done. And I cannot wait to see what you create! I will be back here tomorrow to go over the Second Look of the Cricket with elastic waistband. I would love to see you back! 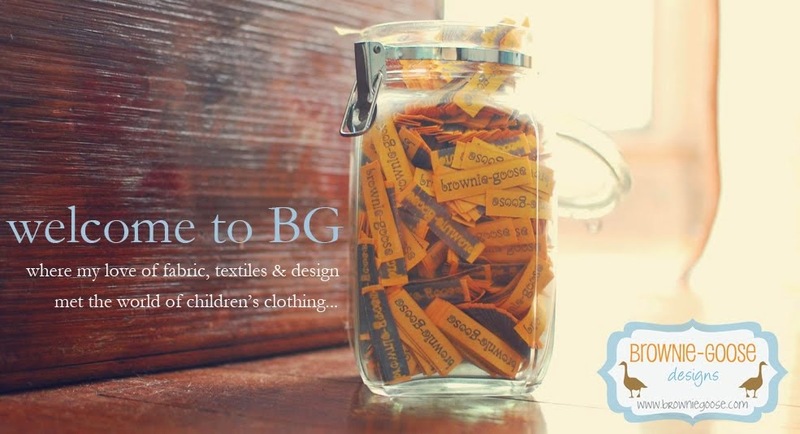 And remember, keep watching for the album to show up in the brownie-goose lovers group on facebook so that you can upload your photos for a chance to win some BG patterns and a gift certificate to Hawthorne Threads! The album will be created on Friday and you have until the following Sunday 10/12 to enter your photos! Peace out ladies - see you tomorrow to start on this one right here! Welcome, welcome, welcome ladies to the Cricket Sew Along. Here I will show you 2 ways to add an elastic waistband to your Cricket dress to give it an added bit of style and versatility! If you are just now joining us, check out this post to give you all the details you ever wanted on the sew along, well at least I hope so...I've been feeling a bit disorganized lately in my attempts to be less Type A. Hehe. If you are here today and ready to sew - let's get started! Today we are here for the First Look (excuse the promotional hoopla on my photos). The First Look - elastic waist Cricket with elastic sewn to the actual dress. Ideal for voile, knit, lightweight cotton, polyester and rayon challis. This would probably work with a quilter's cotton as well, but it may not cinch at the waist as well as a fabric with a little more "give" to it would. A little something I learned along the way...the harder a fabric is to deal with (meaning the more it slips, slides, moves, pokes your eyeballs, stretches, rolls, etc) the better it will drape for Cricket. Seriously, so it will be worth it in the end. Promise. Main difference from pattern - there is no lining to be cut. Instead we will be using a facing. This gives the bodice a bit more give for when you attach the elastic to the fabric. If you did this method with a lining it wouldn't gather as much and lay right. Clear as mud, right? The other difference - I recommend adding a few inches to the bottom hem of the dress since you are now going to be pulling it in at the waist. 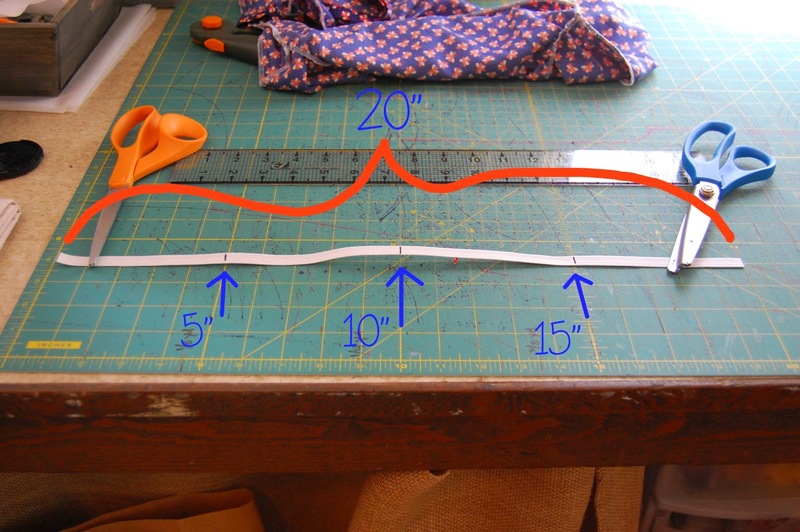 There is a tutorial included in the pattern on how to add length to a curved hem. It is on page 28. Go ahead and mark it down in history that the girl behind BG is actually adding length to a dress. I have quite the reputation for my shorter dresses. ;) I think I added 3 or 4 inches for the 2 I did Lou, but the next one I make I may only add 2 since I prefer a dress above the knee. Extra materials needed: elastic. I prefer to use 3/8" to 1/2" elastic and as I said before I am a slave to Stretch Rite. It really is the best elastic out there in my opinion. You will be cutting this about an inch less than your child's waist measurement. Now, let us get down to business on this Monday morning. Hope you've got your coffee and good tunes ready! Dress front and back - same as you would with pattern but add a few inches to the hem as the cinched waist will pull it up a bit. Sleeves - same, unless you want to do a 3/4 sleeve and the tutorial for that is in the back of the pattern. First things first - let's attach the interfacing to the facing. All of the rules of interfacing from page 7 of the tutorial apply. I have found with interfacing that you have to have a DRY iron. I have the most wonderful steam iron, but it leaks (guessing she has pelvic floor issues as well, us mommas can relate!) so I have another iron that I use for a dry iron. Iron the interfacing (the bumpy side is usually the fusible side) to the WRONG side of your facing. Once the interfacing is fused to your facing pieces, finish the outer edges of the facing. Even though I waited to do this once my interfacing was here to help bulk my material, I still cheated and used pinking shears. Yall, this fabric and my serger are NOT friends. In fact, I must keep them on opposite sides of the lunchroom or else all you know what breaks loose. But finish those outer edges (outlined in white) however you please. Now, run a basting stitch (yellow line below) to attach the interfacing to the facing. Although it is fusible, it will eventually come undone. And I have had it come undone while I was sewing before and it wasn't a whole belly of fun, so run that stitch. And please sew better than this girl draws with a mouse. Oops! Once basted, place your facings right sides together matching up the shoulder seams. 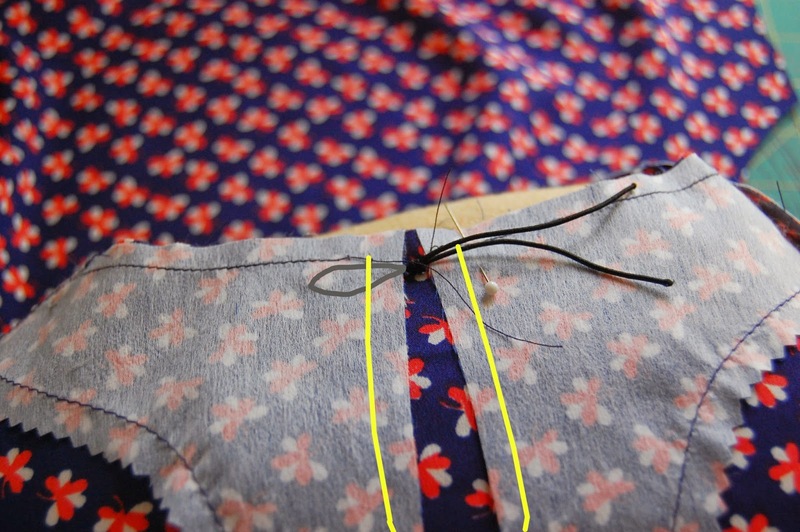 Then stitch the shoulder seams as shown by the yellow lines below. Then, take over to your iron and press those seams out flat. Now, set your facing aside for just a bit. Grab your front and back dress pieces. Before we sew them together we are going to work on marking the waist for the elastic. Now, the best thing to do is to measure your child to determine where the waist should be. 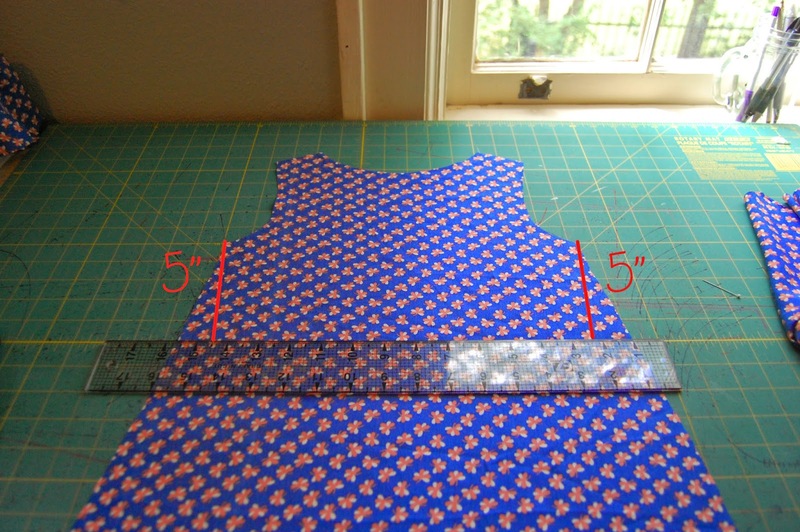 I had totally planned on doing this, but my child was in school and I was sewing away and not in the mood to stop, so I ended up winging this measurement. The odds were totally in my favor, which never happens, but I was so thankful. But what you want to measure is from the underarm to where the waist should be. If you find yourself in my same predicament, you can also grab something out of their closet that has a dropped waist to determine best placement. I went with the lucky number 5". I will refer to my measurement here but please don't get it mixed up with your own! So, what you want to do is to lay either your front dress piece wrong sides up on a flat surface. Measure from the bottom of the arm curve down the dress however much you need and make a mark on the side. In my case, I measured down 5". Do this on both sides. Now, connect the two marks on each side to form a line across the dress front. For this, use a fabric marker or whatever you use to mark your fabrics. You want to be able to see it later when you go to add the elastic. So, if your fabric marker fades - you may want to grab a backup marker. Once you have marked your waist line, repeat the previous steps for the back piece. Measure carefully and please, please, please make sure your waist lines line up on both the front and back. Now, place your front and back dress pieces right sides together, matching the arms and the shoulder seams and stitch across the top at the shoulders as shown below in yellow (note my waist line is still there). Once stitched, take to the iron and press those seams open. Before we go any further, we must stay stitch. Especially if you are using a fabric that moves and shakes as much as mine. I didn't stay stitch the first time and i actually had to re-cut pieces to make them all fit together. It was a disaster. 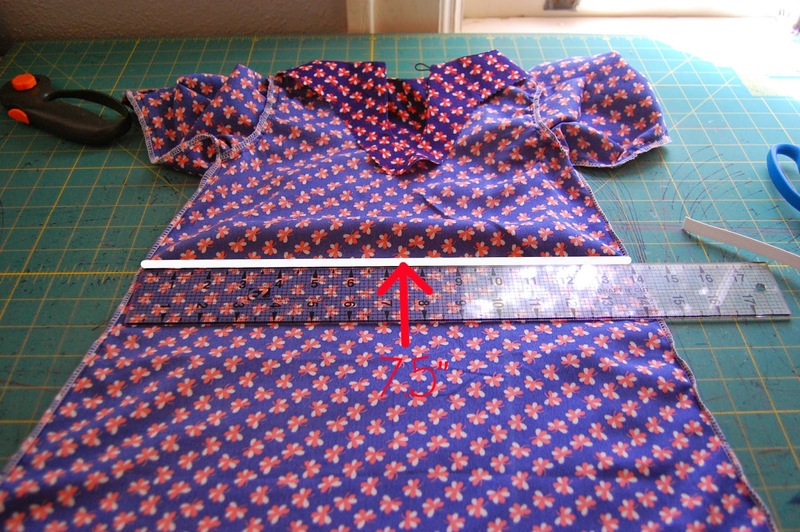 So, just like on page 10 of the tutorial, stay stitch the necks of both your dress and facing pieces. Once those necks are stay stitched, it is now time to place the facing and dress right sides together matching up the shoulder seams and neck lines. Pin like your life depends on it. As I stated in the tutorial, this step is much easier if you have a dress form or sleeve ham to drape it over to work. Once you have it all lined up and pinned, take over to the machine and stitch a circle along the neckline, following the yellow lines. Just as in the tutorial, we are only sewing the neckline right now. Once you have the neckline stitched together, let us turn our focus to the keyhole and elastic button loop. It is no secret that the girl behind BG is a nut for a button. I put them on almost every pattern I can. And one of my fave ways is to use an elastic loop for closure for the button. Now, let me tell you something else the girl behind BG is a nut for. Shoes. I love shoes. And thankfully one brilliant blogger (I wish I could remember who it was so I can give her credit) showed me that my love for shoes and love for elastic button loops can totally be made purposeful. You know when you buy shoes at Target they come tied together with elastic, well ladies with a shoe habit...let that work in your favor. I now save that elastic (I am such a hoarder when it comes to my sewing room) to use for button loops. I haven't bought skinny elastic in years. Granted, I would probably come out cheaper just buying elastic, but that clearly is not the point here. I have also found that things go much smoother if I tie my piece of elastic in knot on one end as shown below. Methods to the madness. For me, it helps the elastic loop stay in place better when going to sew the keyhole. Running right alongside the tutorial on page 12 (meaning I won't put too many details here since it is the same as the pattern) place your elastic loop between the facing and dress. The main difference here is that we don't have a lining layer to contend with. See how the knot keeps the loop in place, and makes it easier to hold? I drew the shadow of the loop in grey just to help give a visual of where it is between the layers. Now, sew along the keyhole opening (yellow line) just as you would on page 13. I should be fired due to my poor mouse-drawing skills. Wowsers. Once the keyhole is sewn, clip your curves and keyhole like a madwoman would as shown on page 14. Flip the neckline right sides out and head over to the iron and steam the snot out of it all. Can you tell I was working with a fabric that made me angry? Haha. Now, something a little different to do to get your facing to lie down flat. I did not want to top-stitch this fabric along the neck as I would have done with any other fabric. I saw the potential for a major temper tantrum and steered myself far away. So if you decide to forgo the top-stitch as well, this is a great trick to keep that facing in place. 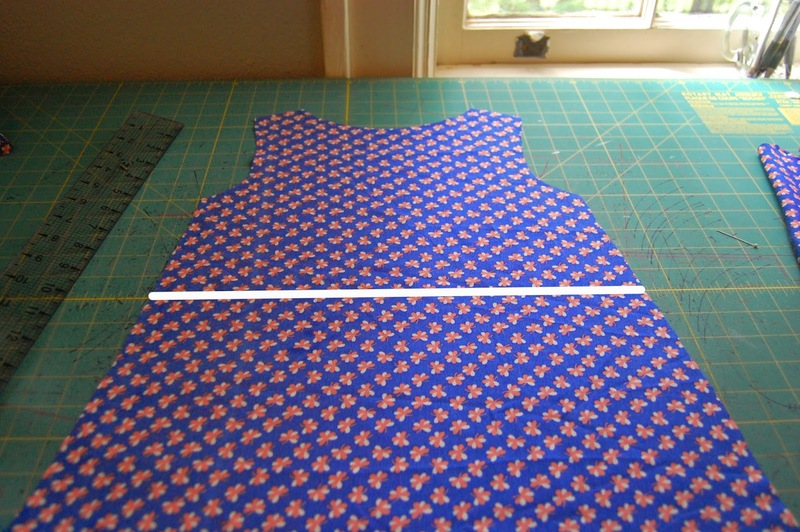 Once the neckline is turned right sides out and pressed, line up the shoulder seams of the dress and facing. Pin them in place. 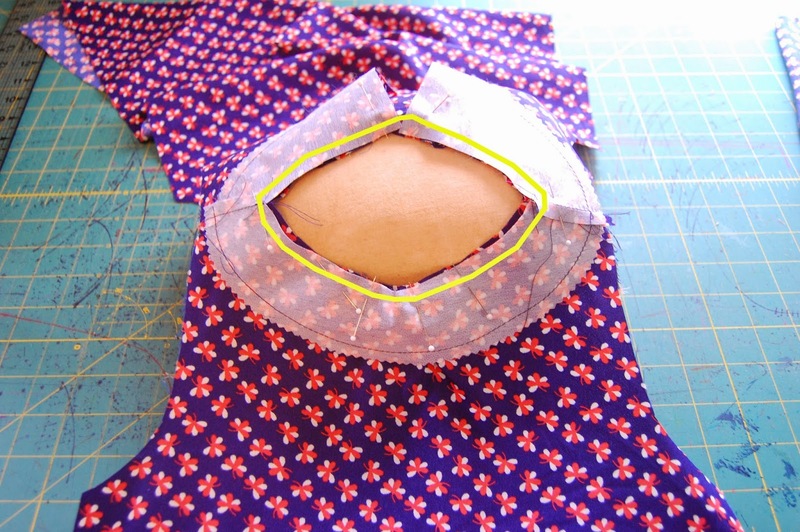 Once pinned, take to the machine and stitch the facing to the dress by stitching in the ditch along the top of the dress shoulder seam as shown by the yellow dotted line below. We did a lot today. So, I think it is a good time to stick a fork in ourselves for the day and come back fresh-faced and wide-eyed tomorrow for finishing this Cricket! Have questions, want to share pics or get opinions? Post to the brownie-goose lovers group on facebook. I cannot wait to stalk it later today to see what all we have going on! Same place, same time tomorrow ladies to finish up the First Look of the elastic waist Cricket! okay ladies - as promised. 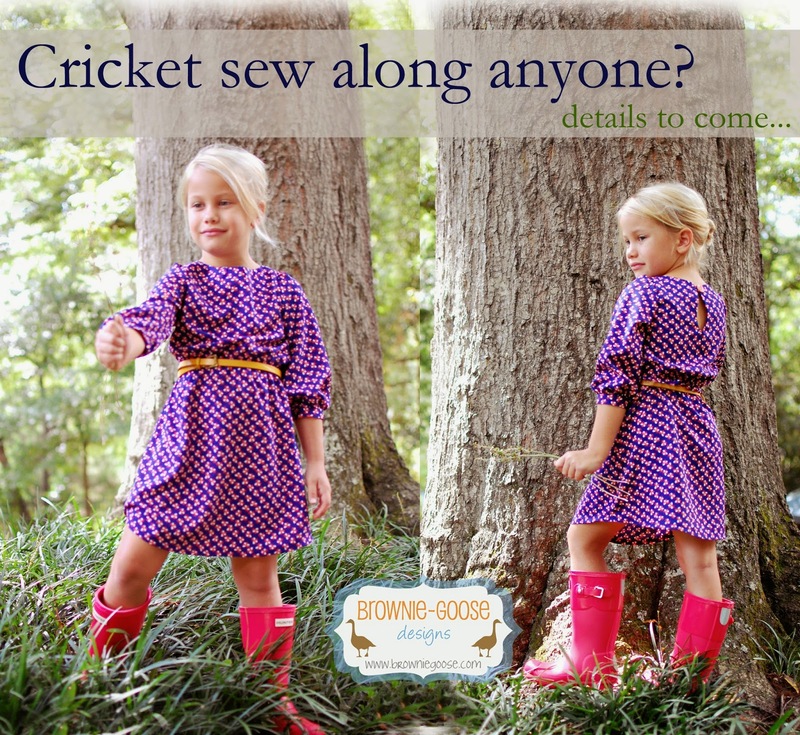 here is a post dedicated to more info about the upcoming cricket sew along! the first look has elastic sewn to the actual dress, which is perfect for a lighter weight fabric with a bit more give and drape. 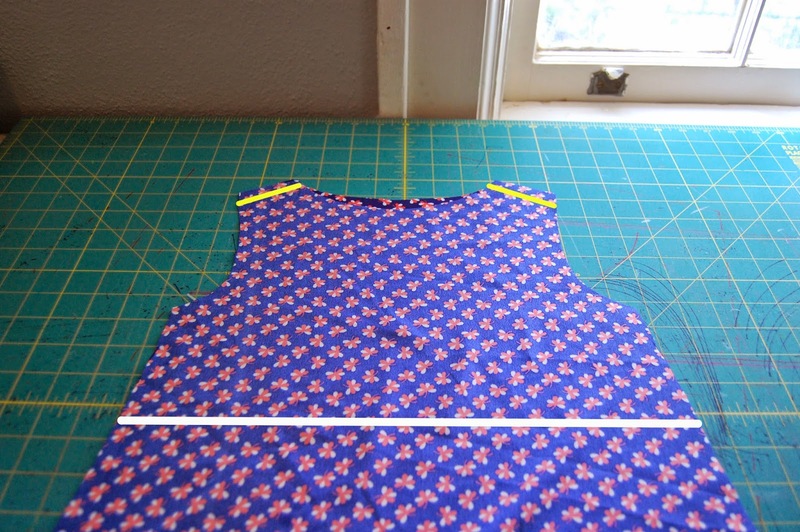 with this construction i also show you how to make it without the lining, and instead using a facing so that the lining doesn't add extra weight to the middle of the dress that would prevent it from gathering so well with the elastic. for this dress - i used a polyester blend that i found at hobby lobby (i just looked to see if it was online but i couldn't find it). it feels so much like a rayon challis to me. it was a pain in in rear end to sew but holy smokes - it drapes like it has no other purpose in the world. this fabric MADE this cricket. the sleeves. oh my dear heavens!!! i added a belt to this one just to go over the elastic in the waist because lou has been begging me for a "grown up girl" dress with a belt. let me be completely honest here. there have been many times when i was jealous over my child's wardrobe. this is totally one of those. but it is also bittersweet because usually while i am jealous, i am like, "nah...i can't wear that. it is completely age appropriate for her but people would be snapping pictures of me and posting things about a crazy lady in athens if i wore it." this time...that isn't the case. i could totally wear that dress and be okay with it. it means my little girl is growing up. sniff. but let me borrow your dress. haha. 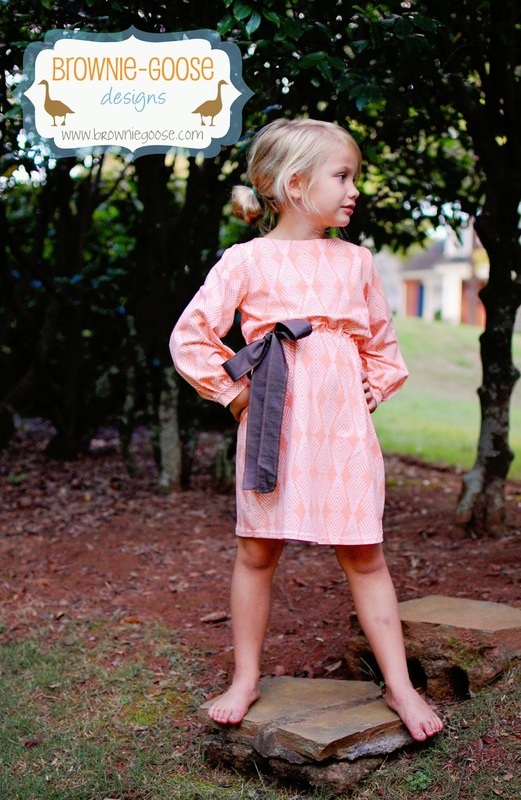 the second look is inspired by one of louisa's fave dresses i made her from a cali faye pattern. she loves this dress because of the bow. it is the sunny mae dress. i adore CFC. seriously if you haven't tried one of her patterns yet, you so should. the designer behind it is also adorable. anyways - i wanted to figure out a way to make the cricket have this adorable bow too. 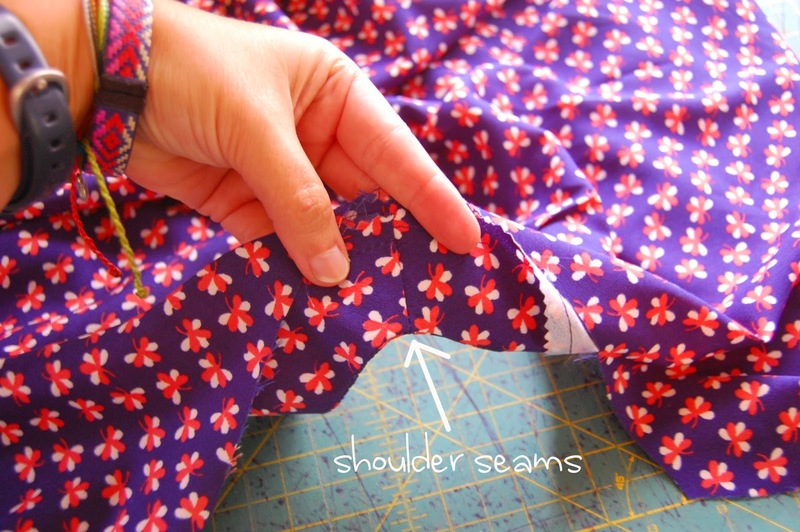 so with the second look i will show you how to use the lining of the dress to make a casing for your elastic and an opening in case your little girl loves a bow too. this is perfect for a quilters cotton, voile or even knit. for this particular dress i used an art gallery knit (plumage knit in apricot) that i swear feels like a pair of the most comfortable pajamas. art gallery is hands-down the best for soft, awesome feeling fabrics. louisa looks so much like my grandmother in this picture that i catch myself staring at her profile. this is the same grandmother that taught me so much of what i know today about sewing. i find it fitting for lou to favor her, here's hoping she will be the 5th generation to sew! sunday 9/28 - BUY your pattern at a discount, in case you don't already have it. i will have it in the shop discounted until midnight EST. friday 10/3 - sunday 10/12 - i will start an album on the brownie-goose lovers group on facebook. this is where you will upload your creations to be entered into the giveaway. only photos in the album will be entered to win, so make sure to put them in the right spot! monday 10/4 - i will announce TWO winners chosen randomly from the album to win 2 BG patterns of choice AND $25 gift certificate to hawthorne threads. eeeeeeeeeeks! elastic for the waistband. for both views 1 and 2 i suggest elastic that is about 3/8" to 1/2". i am a firm believer in stretch rite elastic. trust me. i wish i could say they paid me to say that. haha. sometimes i like to add about 2" to the hem of the dress when placing elastic on the waist. this is not a must have, but you know i like my dresses short...and when you add the waist it will make it just a smidgen shorter, so if you want to - account for about 2" more for the hem. depending on which view you use, you may or may not need the lining. any other questions - holler at me either via email or in the brownie-goose lovers group. chances are someone else may have the same question! and i know not everyone will be able to participate due to jobs, life, schedules, etc. and this makes me sad BUT i always leave the sew along links up in the top of my blog. seriously, go check it out. you may find some awesome lazy susan and pepper sew alongs already there! peace out and GO DAWGS ladies!! enjoy your weekends. lots of BG fun in the next few weeks! okay, so while i was busy falling off the face of the earth i also did a little bit of falling off the face of organization. my bad. it happens quickly and then it snowballs and then i (who hates snow) try my best to crawl my way out from the bottom of that big fat snowball and find fresh air again. well, today i have my delicious fall candle burning and i am pawing my way out looking for fresh air. enough with the code talk...this is what i am up to. i am trying to organize my next few weeks and i must admit, i LOVE to color coordinate my planner and am so very excited about all of the fun stuff that is going on in the next few weeks for brownie-goose. 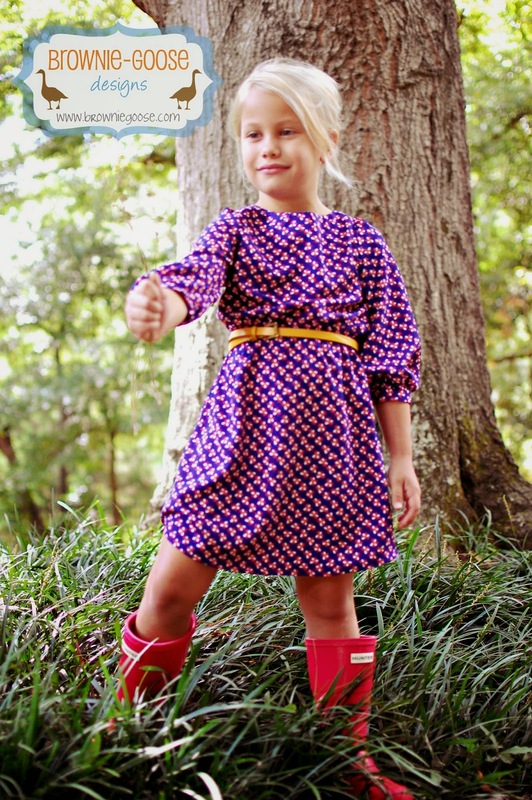 Flip this Pattern - i am so very excited to announce that the hattie was chosen for the october pattern to flip. if you are new to flip this pattern it is such a fun, fun time where bloggers take their creativity and place spins on patterns and their creations are voted upon. this is a fave of mine because i absolutely love to see how creative people are. i love to see what spins are put on patterns and where people's design takes them. it is a lot of fun and there is a linky part that runs from Oct 7-23 that i encourage you to participate in as there are prizes at the end! follow frances suzanne on facebook for more details for this upcoming event. 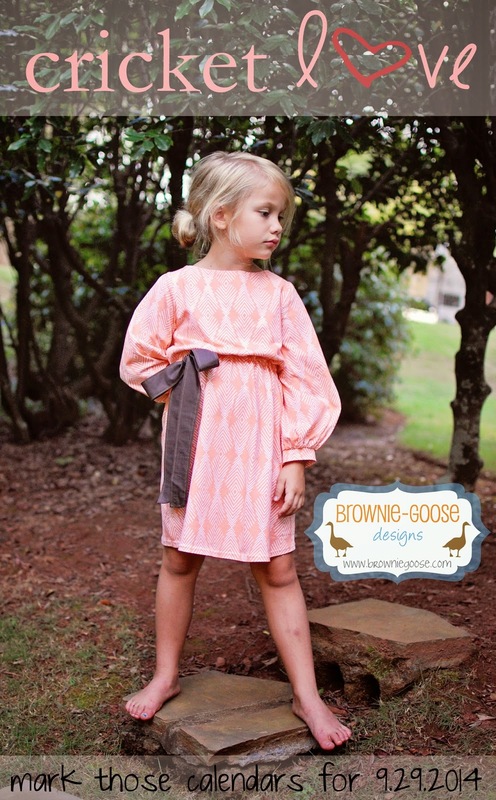 Brownie Goose Online Showcase - this is a first and must not miss ladies! A group of very talented girls have gotten together to bring you the very first online showcase featuring BG patterns. the date for the online showcase is Nov. 10 - but the fun starts even before that with the introduction of the girls behind the showcase and a little on the girl behind BG too. and did i mention there was going to be a giveaway for some BG patterns? eeeeeeks! for more details, follow the showcase on facebook. this will be a ton of fun! Lily Ruffler upsize - finally, right? again, you have asked. and asked, and asked and waited so patiently but the day will soon be here! i don't have a date just yet but know that the pattern has been graded up to a size 12 and will soon be in the shop as an upsize, just as i have done before with the darbys, lolas and summer sailors. get excited. lily rufflers forever! sunday 9/28 - the cricket will be on sale in the etsy shop for those that haven't purchased it before. there is no need for a code, the discount will be done on my end and already marked down the in the shop. don't miss out. buy your pattern and get it taped together and ready to go! monday 9/29 - friday 10/3 the sew along is on the blog! i will split it up in days as i have done before with other sew alongs. while this is going on - make sure to join the brownie-goose lovers group on facebook so that you can share photos, tips, questions, etc. throughout the week. friday 10/3 to sunday 10/12 - upload your cricket creations to the sew along album that will be created on the brownie-goose lovers group. i am giving everyone a little over a week because life happens, i totally understand that. there is a good chance the girl behind BG may be running from another snowball at that point. monday 10/13 - i will will pick 2 winners FROM THE ALBUM randomly and they will each get 2 BG patterns of their choice and a $25 gift certificate to hawthorne threads. pretty awesome, right? get thee behind me snowball! phew, dates are set and calendar is marked. 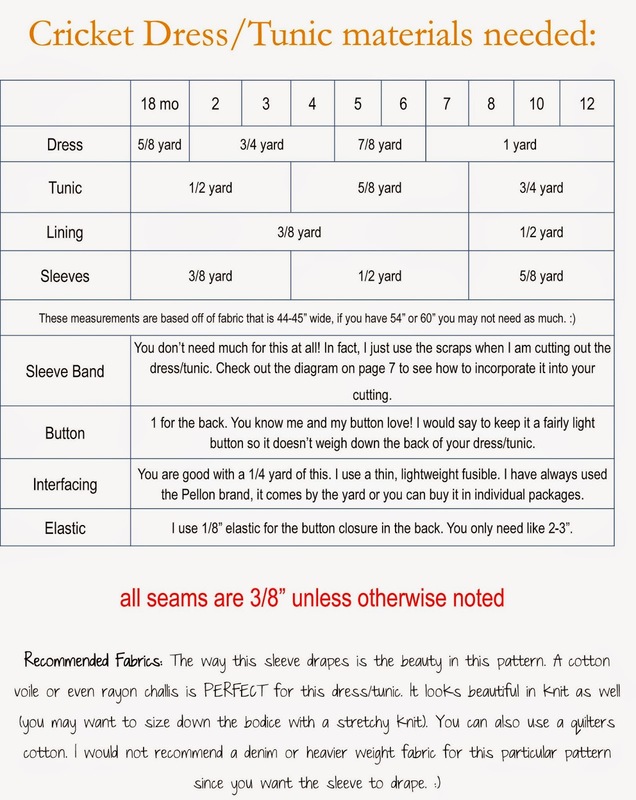 there is more info that i need to divulge for the sew along regarding materials needed, sizing, etc. so that everyone can prepare. that post will be published very soon. promise. i just had to get this done first so i could breathe some fresh air! now, who's excited about all that is coming up!!!??? ?